DALLAS, Nov. 2, 2018 – Bigger, bolder, brighter. These words describe Dallas any time of year, but they especially ring true during the holiday season. From magical musical performances to sparkling city lights, Dallas offers festive holiday fun for the whole family. VisitDallas is excited to announce BIG D Holiday, an annual partnership with arts institutions and area attractions to showcase a full array of seasonal events for locals and visitors to enjoy. It's time to start planning your BIG D Holiday adventure! 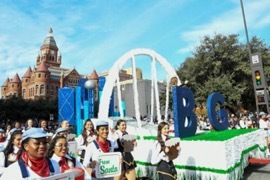 Visit bigdholiday.com for more information and a complete list of events. 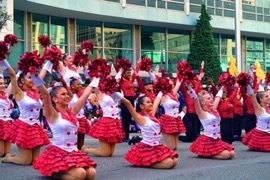 Each year, the Dallas Holiday Parade brings holiday magic and memories to the streets of Downtown Dallas. As one of the largest parades in the United States, this Dallas holiday tradition spans two generations of families while attracting a crowd of more than 500,000 spectators. The 31st annual Dallas Holiday Parade will march through the streets of Downtown Dallas on Saturday, Dec. 1 to ring in the holiday season. This year's parade will feature spirited marching bands, famous characters, magical holiday floats, larger-thanlife balloons and much more. Celebrate one of Dallas' favorite holiday traditions during the most wonderful time of the year with Holiday at the Arboretum, featuring the return of the 12 Days of Christmas outdoor exhibit. The 12 Days of Christmas features 12 elaborate 25-foot-tall Victorian gazebos, with charming costumed characters, whimsical animals and winter scenes made famous by the Christmas carol. Open on select evenings for The 12 Days at Night exhibit, with 500,000 lights throughout the garden. Benefiting Ronald McDonald House of Dallas (RMHD), The Trains at NorthPark will mark its 20th year at NorthPark Center with more than 750 railcars on a 1,600-foot elaborate configuration of tracks and scenes. Each year, the beloved holiday experience welcomes more than 70,000 people and has helped raise more than $13 million for RMHD since its original run in 1987. It's open Nov. 18, 2018 - Jan. 7, 2019. While you're there, capture memories of a lifetime with one-on-one visits and portraits with Santa Claus. Children feel right at home in Santa's cozy living room, complete with fireplace and holiday tree. Take photos with your own camera or purchase professional portraits. Open Nov. 23 through Dec. 24. Kicking off the Friday after Thanksgiving, Hilton Anatole celebrates the holidays with over-the-top festive décor, merry details and the celebrated Breakfast with Santa series. Hilton Anatole is excited to have Peppermint Park back for the holiday season experience this year! Peppermint Park will take place in the Anatole park and will feature games and activities for kids, visits with Santa Claus, holiday shows, train rides around the park, light displays and more! Visitors will also enjoy twinkling lights in the beautiful three-acre park, holiday programming from Geppetto's Marionette Theater and more. Experience the magic of the most wonderful time of the year with the Dallas Symphony Orchestra and Chorus. Don't miss the Meyerson decked out for the holiday with an all-new production of Dallas Symphony Christmas Pops, the return of A Big Brassy Christmas & Organ Extravaganza and A John Williams Christmas. Texas Ballet Theater ushers in the holiday season with one of North Texas' most acclaimed productions, Ben Stevenson's "The Nutcracker," at the Winspear Opera House. In this holiday tradition, Clara receives a mysterious nutcracker from her godfather and it becomes the center theme for an astonishing dream. She travels to The Kingdom of Sweets where she is treated to a celebration of delicacies from around the world. Along with Pyotr Illyich Tchaikovsky's classic score, flying carpets, snow, and talented dancers make this show unforgettable. For a complete list of attractions, visit bigdholiday.com. VisitDallas markets Dallas as the ideal visitor and convention destination in Texas. Dallas – The Most Texan City in Texas – celebrates its heritage in hospitality, and it's the one city where Southern meets modern and legacy meets luxury. Dallas is the leading business and financial center in the Southwest offering travelers an unparalleled array of amenities and a central location with two major airports with more domestic nonstop flights than any other U.S. city. As the ninth-largest U.S. city, and part of the fourth-largest metropolitan area in the nation, Dallas is the top visitor destination in Texas. You really can do it all in Dallas. For more information, visit http://visitdallas.com.